So what was your impression of the game? Does it look like it might have legs or does it look like it might be a flash in the pan like Shadow War Armegeddon? The limitations on the number of units available has me concerned about buying in. "I used my very old Chaos Marines, which meant I had very little choice in what to take because I only have one squad painted." Wow. You don't usually hear that statement with respect to 40K. At least around here. Good for you. Moonbeast noted – "The limitations on the number of units available has me concerned about buying in." I think you're looking at it the wrong way. There are LESS limitations on units available. Right now each 40K army has more units available than the same 40K faction Killteam, true. But the huge advantage of Killteam is that with such a small number of models needed, you can easily and quickly buy and paint up ALL of the 40K factions you've ever been interested in. Each faction may not have many choices but if you add up all the total KT factions' troop types, you get a lot of variety. Which I think means more freedom. I don't have to invest a colossal amount of money and time to paint up an entire army of something I am only peripherally interested, like Necrons for example. But I can buy and paint a couple of boxes of Necrons for KT without any trouble at all. I suspect it might be the same cost and effort to paint one decent sized 40K army as it is to raise ALL the Killteams listed in KT. Of course, you might be thinking of the differing interesting combinations of troops you can field from you single army, to give you interesting synergies and tactical choices on the table. Which is true, but in the Killteam campaign – or one off games, if you buy the advances – each figure can develop in different ways, so unlike 40K, each figure has different skills and uses. Honestly, I'm more excited about the ability to easily dabble in other factions. Well, I've played a second game now. Hard to say for sure the "legs" a game will have after only two games. There are some.. strange… restrictions on weapons/wargear and in some cases available units. This is because it seems they wanted to make it possible to build any of the options of a certain type in a kill team from one plastic box. As an example, the only heavy weapon a chaos space marine can get is a heavy bolter because that's the only one that comes in the plastic chaos marine box. So chaos marines can one guy with a flamer or plasmagun or meltagun, and one guy with a heavy bolter. Can't take two flamers, or a missile launcher, etc. That also ended up limiting which of my models I could actually use. However, if you are playing with friends you can probably work around that limitation. Also, I will say the game has really inspired me to go assemble and paint up a few more figures to use with Kill Teams. And the terrain that comes with the box is great. I think the "legs" from the game, for me, will come with paying lots of different Kill Teams. I already have a few that I have enough painted models to do, but still want to convert and paint some other options or some that are modelled to be some of the specific specialties. But even once I've tried all those out there are a bunch of other ones that I don't have a full army for but will definitely want to do Kill Teams with. Just one or two plastic boxes will get you enough to do any of the kill teams, and I think it will be fun to assemble them specifically with Kill Team in mind and really give some personality to the specialists. I will also say, that there definitely are some balance issues and the game can be super swingy. The rules are very similar to 40k, but with 40k you roll so many dice that they are more likely to average out. Here you are rolling for one guy at a time, so a few lucky rolls can have a big impact. And in terms of balance, I'm sure 40k has the same issues but again here it might be exacerbated by the small scale. For example, if you take the same points of base Intercessors versus base say guardsmen, the guardsmen will get slaughtered every time. 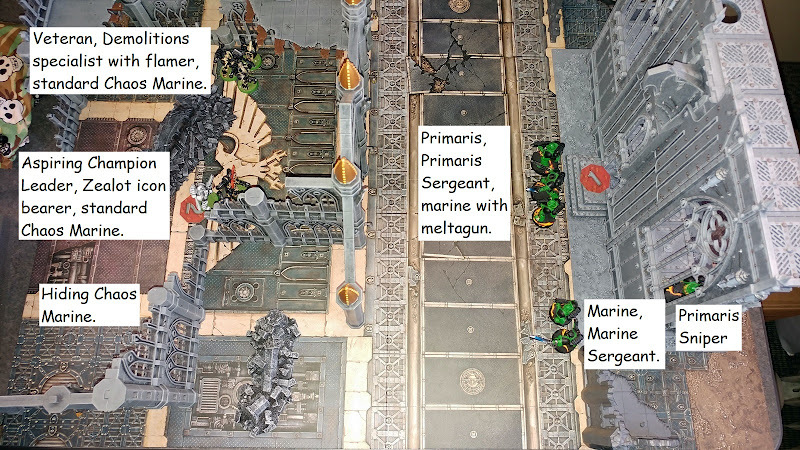 The points system kind of assumes that if you are taking guardsmen against marines, you are going to take lots of melta and plasma weapons, so if you don't do that, you aren't going to stand much chance. So you probably want to have enough options to take different weapons against different opponents. So how are you finding the campaign rules? I'm looking to join a nearby league (I don't play 40k, but Kill Team is an excuse to buy a box of those cool new Thousand Sons minis). I find the "every starts with a set amount of resources and they slowly lose them over time" to be interesting, compared to most campaign games where you amass resources. Well, I'm not really far enough in to really have a strong opinion on how the campaign runs. There is also an option to randomly generate each of the resources, which could help things move faster. In some cases a player gets some choice in which mission is played, so you could in that case pick a mission that targets a resource that your opponent is low in (or you have plenty of, in case you lose). Now, because losing a mission generally has you lose some resources but you rarely gain any, you have to make sure each player plays around the same number of games, or else have some kind of resource penalty for missing a game. Otherwise, playing more games is really a disadvantage when it comes to the campaign victory conditions.